I have mentally composed a novel. It’s a very good one, full of rich character development and an imaginative plot. I’ve written down some of it, but only a minute percentage of the whole. I always seem to be making excuses as to why it remains in my head and doesn’t make its way to the page. None of these excuses are very good, most involve sheer laziness, some are rooted in self-doubt, and a handful are not so much excuses as they are diversions into numbing the mind rather than stimulating it. I’ve got the key to my castle in the air, but whether I can unlock the door remains to be seen. If we are all alive ten years hence, let’s meet, and see how many of us have got our wishes, or how much nearer we are then than now. I knew that Alcott based the characters on her own family, and Jo specifically on herself, so I thought I’d dig a little deeper and see how much of her own experiences she really put into her work. 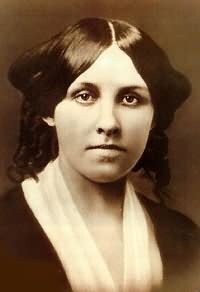 What I found out was both shocking and enlightening: Louisa May Alcott hated Little Women. Alcott really needed to make a quick buck to help support her family, and having had some small successes as a writer previously, she was persuaded (from all accounts more like forcefully coerced) into writing a novel about and for girls. She didn’t want to write it. She had other ideas, other stories to tell, and would have much rather told them instead. With the promise that she could put out more of her other work after publication, she banged out Little Women in just a few months. When she handed it over to her publisher, she made a point of telling him what a terrible book she thought it was. But it was 1868, and no one had ever read anything like it. Girls loved it. They loved it so much, that she wrote and published a sequel in the next year just to appease their ravenous need to know the end of a story she thought she had already completed. What fascinates me the most about this knowledge is the realization that a book I always took to be progressive was seen by its author as not progressive enough. Alcott was a force of nature, surrounded her entire life by free thinkers, and in her published works outside of Little Women she wrote about power struggles, pain, and her desire to change the very foundation of social structure. I’m not quite as bogged down by the idea of perfection as she was (her having been raised by transcendentalists), but I certainly struggle with it. Yet, I find it peculiarly comforting to know that the author of a work I greatly admire thought it wasn’t good enough. Because, when it comes down to it, what is enough? Or, for that matter, what is good? The best thing a writer can hope for is to write, and leave the value judgements to someone else. It’s hard to constrict your elaborate thoughts to paper, but you should really give it a try! Judging by this post, you’re clearly a talented writer. I’m sure you would enjoy writing it, and from the looks of it, it would also be enjoyable to read! Good luck!